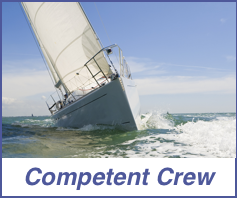 Not sure whether a RYA Competent Crew or Day Skipper course is the right choice for you. Take our quiz to find out. This course is for beginners and those who would like to become active crew members rather than just passengers. It is one of our most popular RYA Practical Sail Cruising Courses in Greece. Experience living on board and really get to know the boat. Virtually all the course is hands on. You are the crew – without you, the sails won’t go up and the boat won’t be steered. Knowledge of sea terms and parts of a boat, her rigging and sails, sail handling, ropework, fire precautions and fighting, personal safety equipment, man overboard, emergency equipment, meteorology, seasickness, helmsmanship and basic sailing, general duties, manners and customs, rules of the road, dinghies. Method of assessment: Continual assessment by your Instructor, no tests or exams. Clients live aboard a school yacht as it cruises to and overnights in different harbours and bays each night. Price includes all tuition, accommodation on a school yacht, meals when at sea, fuel, mooring fees, use of wet weather gear, study materials, bedding, towels and Greek VAT at the appropriate rate.